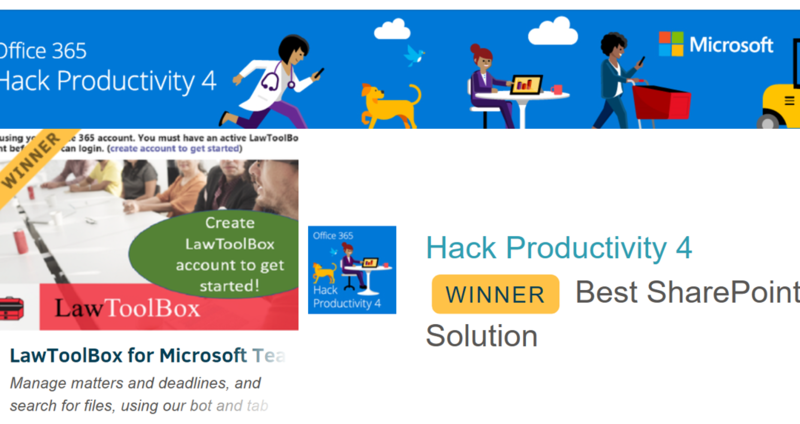 Congratulations to the entire LawToolBox team for winning BEST SHAREPOINT SOLUTION (see more) in the Microsoft Hack Productivity contest (more)! Our enterprise-ready app uses Microsoft Graph API to leverage the native extensibility of the Microsoft Teams platform to surface a powerful tool for litigators, law firms, and corporate legal departments to create matters, view reports, calculate deadlines, and sync with Outlook. The intuitive combination of a BOT and TAB provides easy and powerful access to upcoming deadlines across all matters the user is working on. Users can jump back and forth from quick insights in the bot to more robust tools in the teams tab. Our Teams BOT gives users a bird’s eye view of their deadlines and matters: For example, users can retrieve important Microsoft Delve insights on team members they work with. Users can also retrieve valuable statistics on the average length of time it takes to litigate a matter, or prosecute a motion, by venue. Another important function is that users can retrieve matter deadlines and filter by search terms, calculate and edit deadlines, then add matter deadlines to Outlook calendars instantaneously. When users want more robust deadline management tools they open the LawToolBox TAB in Teams, from which they can access existing matters or create new matters. When a new matter is set up, the user assigns the applicable deadline calculator, and then LawToolBox uses the Microsoft Groups to automatically create a matter-specific document folder, calendar, notebook, and shared Inbox inside Microsoft Office. Our AWARD-WINNING app for Teams provides an important new tool to manage compliance deadlines wherever and whenever legal professionals want them. If you want to find out more about our Teams product, or our also award winning Add-in for Outlook, email support@lawtoolbox.com or call 303-759-3572. Got Deadlines? We’ve got an Outlook App for that! LawToolBox is so simple anyone can start using it in minutes! Request a 10 minute demo and start using LawToolBox the same day!